Plushies!! I vaguely remember my parents having a hard time getting me out of the souvenir store at the Toronto Zoo. I love animals and stuffed toys so that place was a danger zone indeed… and probably a bit overpriced as well. I can’t wait to take Sammy there! I can blame all the impulse shopping on him! This entry was posted on Monday, August 23rd, 2010 at 12:00 am and is filed under BEAR NUTS. You can follow any responses to this entry through the RSS 2.0 feed. You can leave a response, or trackback from your own site. Evil is taking this better than I thought he would. Most of the others are raging, but Evil is just leering! 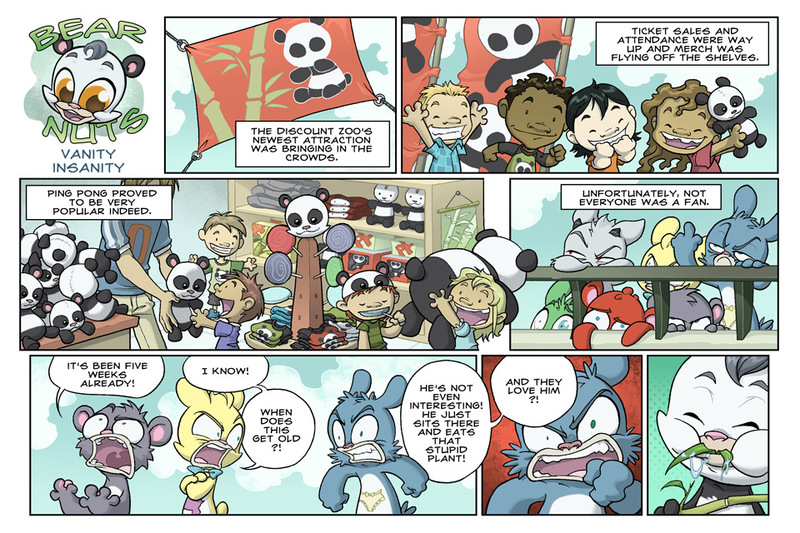 Man, I want a panda plushie… I want a Prozac Bear plushie more though. I also really want that kid’s hat. PS, totally love the last panel of Token Asian Bear stuffing his face. So drooly. They’re PANDering to the Panda? unBEARable! NEW CHARACTER NEEDS CATCH PHRASE PLEASE! >:D Anyway… lol, I was reading the comments of an older comic, #28 or something, and someone said that there should be catch phrase for the bears. Since it’s a brand new character there is still time! :D Would you think of wanting doing something like? If so how about his/her (the panda) thing is to say “bonjour”? And thought so: Vanity. This should be good: PP vs Lech vs Gay. Let it begin. Oh no! Bear is driving sales margins! i love lech flipping ping off, but why hasn’t evil burned down all the bamboo at night? it seems like something he would do. I wrote this yesterday, but then my internet broke down, now I’m kinda late, but maybe you like it anyway. In an attempt to un-spoil the panda’s name, I’m giving you a poem adressed to his zoo alias. you are so much more than black and white! but so what, for you could never stand her. tasty twigs, true tongue tickling to tender. What is in your name, or a bamboo’s? Does it flavor, say, of veggie goose? in the whiteness of your coated rear? you’re the new character of the day. Yeah… now the name’s official, so what. It’s a splendid opening page however! “Ping Pong” is just adorable and I’m really excited about what the other bears’ attitude towards him will result in. @Lea…Okkaaayyy…. anyway Vanity was imminent. Great job allison keep upthe good work. @13yaroza: You think the panda should speak french? I suppose it would be good and odd. @Calbeck: lol, best part of that whole series! @The Origami Guy: I love that actor too! Especially the bit about cutting out hearts with spoons. @Lea: lovely, my fav line is “the whiteness of your coated rear”. What a cute new bear. :) Looking forward to what’s coming next! OMG…I’m in love with Pirate Evil. He is TOO COOL. oh great, now I want a evil plushie and a death plushie. also I can’t wait for fan expo! I wants a book! I be COUNTIN DOWN ZEE DAYS! @admin: Wouldn’t it be something if Ping Pong is the one thing Crack Bear isn’t freaked out over? I love that Lech is flipping the bird. Hilarious! Hahahah man i love how the kids always seem to have these square beefy unchild like faces! @admin: Glad you like it. =D I was less lucky with another poem I wrote that day, probably because it’s real depressing and people don’t like to read depressing things, since it’s summer and all. I should probably collect all the depressing stuff I do now and publish it in winter when people enjoy being depressed. Also, I ramble too much. I should get back to doing something useful. LET’S GET READY TO end the ramble… ! Now. Regards. Kinda hoping there will be some funny plot twist informing the actual bears that pandas aren’t bears. @Kaos: I was interested to read that their young stay with them for 18 months. That’s a pretty long time when your life span is limited, probably why they don’t mate very often! @Nicole: I like Pirate E too but steel yourself because he’s going down! @Ben: I can’t wait! I’m a total shut in at home!! @Hex: STAB IT DEAD! IN THE EYES!! Ping Pong is, I’m assuming, going to be referred to as Vanity Bear in the future (I’m guessing this from the title of this arc, I don’t honestly know). Does this mean that the other bears – Prozac, Evil, etc. – all have “names” as well? Perhaps something the zookeepers refer to them as? *Edit* I posted this on your welcome page too. Whoops. Hurrrr. how come he doesn’t have black fur around its eyes?